CO2 emissions leveled off between 2014 and 2016. But annual growth of CO2 in the atmosphere rose to more than 50 percent above that of past decades. What explains the contradiction? In 2015, we earthlings – some 7.5 billion of us – discharged 36 billion tons of carbon dioxide into the air from many tailpipes and smokestacks. That is about the same amount of planet-warming gas belched out in 2014, and the figure remained largely unchanged in 2016. After a century of exponential growth in the mass of carbon dioxide ejected into the air, the leveling-off of the output caught many observers by surprise. It’s explained partly by widespread substitution of natural gas for coal in electricity production and by expanded use of wind and solar energy. 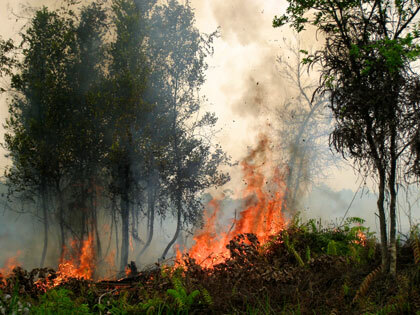 Forest fires in Indonesia, September 2011. Photo credit: Rini Sulaiman/ Norwegian Embassy for Center for International Forestry Research (CIFOR), via Flickr. Although the amount of CO2 ejected into the air leveled off in 2015, the quantity accumulating in the atmosphere did not let up. Rather, it spiked. Indeed, the concentration of the gas increased that year by 3 parts per million (ppm), 50 percent more than in the previous year and the average annual increase of the prior four decades. Researchers hadn’t observed an increase so large since they began systematic measurements of CO2 in the atmosphere back in 1958. The amount of CO2 in the air probably hadn’t surged so much in a single year since at least the end of the last ice age – 10,000 years ago. A scientific article published in late 2017 explains this apparent paradox. The extra CO2 came from the world’s tropical forests. Beginning at the end of 2014 and lasting 19 months, the strongest El Niño recorded in more than 50 years warmed and dried the tropics – increasing wildfires, slowing tree growth and speeding-up the rotting of dead vegetation – releasing billions of extra tons of CO2 into the air. The authors of that 2017 paper also reported a surprise: Not all tropical forests reacted to the El Niño the same way, a finding the coauthors say could help improve climate models. The forests most likely rebounded in 2017, and the trend of CO2 growth appears to have returned to its long-term average. But the incident may preview a worrisome mechanism that climate change might permanently trigger, says Junjie Liu, the paper’s lead author and a scientist at NASA’s Jet Propulsion Laboratory in Pasadena, Ca. Many climate models project that hot, dry conditions in the tropics, such as those of 2015 and early 2016, will be more common later this century. She says that the results reported in her paper hint that in the future, the tropics “may release more carbon into the atmosphere or absorb less,” speeding the buildup of carbon dioxide in the atmosphere and further accelerating warming. For every four tons of CO2 created in the combustion of fossil fuel, only two tons accumulate in the atmosphere. One ton dissolves quickly into sea water and eventually sinks. Forests absorb a second ton, with the trees transforming the gas by photosynthesis into carbon-rich compounds such as sugar and cellulose, some of which becomes permanently sequestered in soil. “Nature has done us a fantastic favor,” halving the amount of CO2 amassing in the atmosphere, says Scott Denning, of Colorado State University, an atmospheric scientist not involved with the study. That ocean uptake is likely to continue unhindered in the coming decades, Denning says. The future of forest uptake is less certain. Researchers have tried for years to forecast whether climate change will damage forests and disrupt this critical carbon sequestering process. Forests in temperate and tropical regions alike take up carbon dioxide and moderate climate change. But many climate scientists say tropical forests – including in the Amazon, the Congo, and Southeast Asia jungles – are the most likely to experience less carbon intake. The consequences, if they do ease off, would be grave. In an average year, primary tropical forests soak up nearly 5 billion tons of CO2, according to figures published in one widely-cited study. Some research suggests that this carbon sink is absorbing less and less, but the evidence is contested. The huge scale and poor infrastructure of tropical forests have bedeviled attempts to determine just how they’re behaving. The 2017 Science article drew on some of the first measurements from space of atmospheric carbon dioxide. That research almost didn’t happen. On February 24, 2009, NASA launched a Taurus rocket topped by the Orbital Carbon Observatory (OCO), a satellite designed to measure precisely the amount of CO2 above patches of Earth’s surface as small as one-mile square in area. The satellite was to fly over the poles in systematically shifting orbits, passing above the entire planet every 16 days. With a lot of number crunching, researchers had planned to turn the pattern of readings into comprehensive maps of the world’s sources and sinks of the gas. But the rocket malfunctioned just before nudging the refrigerator-size spacecraft into orbit, and the satellite tumbled into the Indian Ocean. One of the Science paper’s 16 coauthors, David Schimel – a leading expert on the carbon cycle, the circulation of carbon between the atmosphere and reservoirs on Earth – watched NASA’s live feed of the launch in horror. NASA immediately vowed to build a replacement. 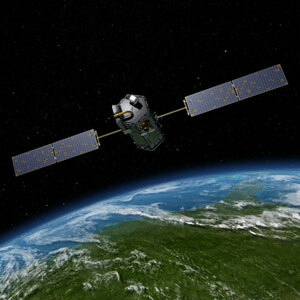 Five and a half years later, in mid-2014, the agency successfully launched the satellite’s twin, nicknamed OCO-2. The orbiter has since circled the Earth some 20,000 times, making hundreds of millions of CO2 readings. After the 2015/2016 El Niño struck, Liu says, she and her collaborators realized that they’d been handed a rare opportunity to observe tropical-forest response to future-like conditions at a spatial scale not previously measurable. They looked at OCO-2 readings and discovered that the El Niño had caused marked changes. In a normal year, CO2 accumulates in tropical trees and soil like water filling a kitchen sink with the tap running. During the El Niño, the sink’s level rose rather than went down, as if a cosmic hand had shut the tap and unplugged the drain. The net result on tropical forests was as if humans beings had increased fossil fuel use by more than 25 percent for a year, releasing an extra 9.5 billion tons CO2 into the atmosphere. OCO-2’s specialized orbiting camera offers the scientific community a powerful new tool. Previous research, says Liu, had treated tropical forests “as a box, as a single region.” But now they can peer inside the box at how various tropical jungles respond to year-to-year differences in the climate. Three mechanisms together determine a forest’s impact on atmospheric CO2. Tree growth takes the gas in. The other two, decomposition and forest fires, give it off. Numerically, the net amount of CO2 soaked up by a patch of land is equal to the amount absorbed by tree growth minus the sum released by decomposition and fire. The research team determined plant growth by measuring the amount of light emitted in a specific wavelength given off by plants engaged in photosynthesis. OCO-2’s equipment had not been designed for this job, but fortuitously, scientists could coax it into gathering the needed information. The researchers determined where fires had let off CO2 with data collected by NASA’s Terra satellite, a spacecraft that had been orbiting for nearly 20 years. It, too, had been designed for a different purpose: Its pollution detector measures near-ground levels of carbon monoxide, a sensitive indicator of fire. The scientists determined plant decomposition mathematically from the other measurements. In the Amazon, nearly all of 4 billion extra tons of CO2 let off had come from weakened plant growth. In the Congo, where – in contrast to the Amazon and Asian forests – the El Niño did not hinder rainfall – most of the extra CO2 released had come from increased plant decay.